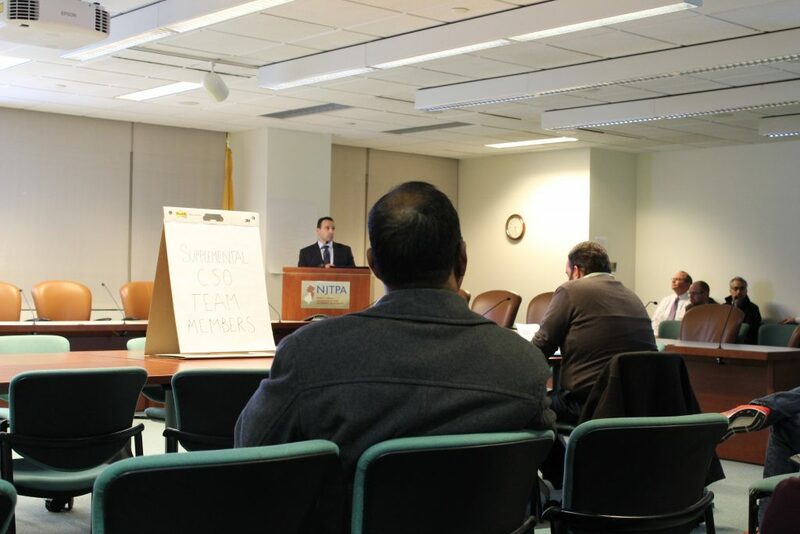 In Newark on March 7, municipal planners presented methods to combat sewage overflow. Hudson County’s sewage authorities are collaborating with towns on an initiative called “Clean Waterways, Healthy Neighborhoods.” The project is in the planning stages to reduce the amount of Combined Sewage Overflow (CSO) resulting from storm water incidents. Combined sewage systems channel storm water and sewage through the same tunnels. In heavy storms and snow melt, wastewater exceeds the intake capacities of sewage treatment plants; wastewater runs off into nearby waterways including the Hackensack River and the Hudson River. The water contains untreated, or partially treated, human and industrial waste, toxic materials, and debris which is discharged through outfalls into bodies of water. The towns include Bayonne, East Newark, Guttenberg, Harrison, Jersey City, Kearny, Newark, North Bergen, and Paterson. Each municipality is required to capture 85 percent of wastewater discharged during CSO events. When federal and state legislators passed the Clean Water Act, New Jersey’s Department of Environmental Protection (DEP) set guidelines to establish projects to replace combined sewer systems, and evaluate alternative measures to combat the CSO problem. The extent of the problem was calculated with a public notification system that uses data sets to predict overflow events at each outfall location in the region. In 2015, New Jersey Pollutant Discharge Elimination System (NJPDES) permits were given to 25 New Jersey municipalities and treatment facilities. These permits gave each entity until July of this year to submit evaluation reports to the DEP. Selected CSO-control alternative reports are due about a year later, by June 2020. The Passaic Valley Sewage Commission (PVSC) and the North Bergen Municipal Utilities Authority are partnering with the towns involved. The area affects 1.5 million residents, and contains 115 CSO outfalls that discharge into local waterways. Discrete municipal plans mitigate the pathogens and pollutants discharged into waterways from their sewer systems. At the 11th Long Term Control Plan Meeting on March 7, municipalities unveiled their evaluations. The Clean Waterways, Healthy Neighborhoods representatives, along with CSO team representatives from each town, described some of the northern New Jersey CSO technologies that are being evaluated. The most expensive options to mitigate sewage overflows include expanding sewage treatment facilities, creating larger tanks and tunnels for wastewater, creating new treatment facilities, reducing flows to collection systems that frequently reach maximum capacity, and disinfecting CSO discharge. Many municipalities are also evaluating green infrastructure such as rain gardens, pervious pavement, and rooftop water collection as a way to capture storm water runoff before it reaches sewers. Still, separating sewer systems is the most effective treatment to combat CSOs. This would eliminate CSOs entirely, leaving only storm-water discharges. According to Michael Hope, a PVSC environmental consultant, separating these systems would cost hundreds of millions throughout the region, and construction would be a major disruption to traffic patterns in widespread areas. In Bayonne, planners found that using a currently-offline municipal treatment plant near the largest CSO area would be most cost effective. They will consider retrofitting a number of existing storage tanks, which would lower the number of CSO events. Planners said improvements to pumping stations would move sewage to where it needs to be to mitigate overflow. They also suggested placing Paracetic Acid disinfection systems at the site of CSO outfalls, in order to sterilize the contaminated water that does manage to discharge. They estimated that green infrastructure projects could also reduce annual CSO volumes by 3 percent. Twenty-eight potential green infrastructure projects were identified by a Rutgers University feasibility study. In Jersey City, planners from Arcadis, a development consultant, anticipate developing green infrastructure in public properties, such as rain gardens, to eliminate storm-water runoff at the source. They also anticipate separating the sewer systems into two channels for storm water and sewage. Planners estimate that creating offline storage, such as deep tunnels and tanks, could create capture rates of nearly 100 percent for wet weather events. The costs, overall performance, environmental considerations, and technical considerations have not yet been evaluated for the June deadline. North Bergen has two sewage treatment plants. The Central Pump Station serves the west side of North Bergen, discharging to creeks west of the township. The Woodcliff treatment plant, which is shared with Guttenberg, discharges into the Hudson River. Its CSO control plan entails upgrades to the Woodcliff treatment plant that are already underway, which will increase the plant’s capacity to treat 2 million gallons per day more than its current rate. The town is also considering storage improvements, disinfection at outfall sources, and green infrastructure to mitigate storm water runoff. In Guttenberg, combined sewage is discharged to two treatment plants, one owned by the North Bergen Municipal Utilities Authority, and another by the PVSC. Guttenberg is currently providing $8,400,000 of the $20,000,000 being spent on expanding North Bergen MUA’s sewage treatment plant. Project Manager Mark A. Hubal named a number of things that can be done in addition to expanding that plant that would meet an 85 percent capture rate. They include the separation of sewer systems in Galaxy Towers(which houses a fifth of the town’s population), or creating green infrastructure on rooftops. Hubal estimates that the town could spend anywhere from $8.75 million to $16.4 million on the project. To see the presentation from the March 7 meeting, visit www.njcleanwaterways.com/long-term-control-plan.